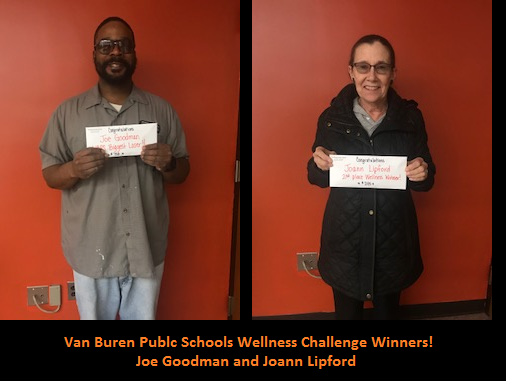 Congratulations to Joe Goodman, Head Custodian at Tyler Elementary, for coming in 1st place in the District's 1st Annual Wellness Challenge! Joe has lost 20.7% of body fat during the 10 week weight-loss, healthy habits challenge. Fifty (50) staff members paid $20 to participate and were weighed-in biweekly. Sixteen (16) of those 50 completed the challenge and collectively lost 239.9lbs! Joann Lipford, Head Cook at Tyler Elementary, came in 2nd place, losing 13.7% of body fat! Special thanks to Yoga Jule, Starseed Yoga, and the Romulus Athletic Center for their prize donations to keep our participants motivated!